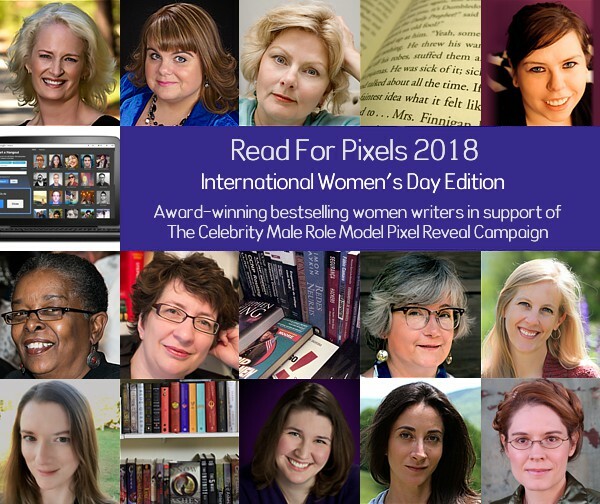 JANUARY 25th, 2018 (WORLDWIDE): The Pixel Project , a 501(c)3 anti-Violence Against Women non-profit, is proud to announce their third International Women’s Day (IWD) Edition of their “Read For Pixels” campaign featuring live Google Hangouts with award-winning bestselling female authors in honour of International Women’s Day (IWD) 2018 and in support of the Celebrity Male Role Model Pixel Reveal campaign which aims to raise US$1 million in aid of The Pixel Project. Participating authors include Amanda Hocking, Ann Aguirre, Beth Cato, Beverly Jenkins, Carrie Vaughn, Dana Cameron, Diana Rowland, Faith Hunter, Jodi Meadows, Lauren Oliver, Lynn Flewelling, and Molly Harper. “Read For Pixels” IWD 2018 Google Hangout sessions will run on Friday, Saturday, and Sunday evenings throughout March 2018. Each session will feature an author reading from one of their books and discussing their writing, why they support ending violence against women, and women in the media, geek culture, and popular culture. Each session will also include a live moderated Q&A session for fans and book lovers to ask their favourite authors questions in real time. Participating authors have also generously donated a range of exclusive goodies to help The Pixel Project encourage fans and book lovers to donate to the Pixel Reveal campaign including: unique author-curated goodie bundles, signed first editions or book bundles by participating authors, sonnets written especially for donors, 1-to-1 Skype calls to talk about writing, tuckerisations, and more. Additional goodies are donated by NewCon Press, acclaimed authors Aliette de Bodard, Genevieve Valentine, Jacqueline Carey, Karen Rose, Kimberly Derting, Leigh Bardugo, Susan Dennard, and Nalini Singh, and up-and-coming YA author Juliana Spink Mills. Donations begin at as little as US$5 and the goodies are available to donors as “thank you” gifts and perks depending on the donation amount. Fundraising will take place in tandem with the Google Hangout series over the month of March. For more information about Read For Pixels, contact Regina Yau at info@thepixelproject.net or visit: http://is.gd/Read4Pixels. The Pixel Project is a complete virtual, volunteer-led global 501(c)3 nonprofit organisation whose mission is to raise awareness, funds and volunteer power for the cause to end violence against women at the intersection of of social media, online communities new technologies, and popular culture/the Arts. Their flagship initiative is the Celebrity Male Role Model Pixel Reveal campaign which aims to turbo-charge global awareness about VAW using social media while raising US$1 million by getting a global audience to collectively unveil a million-pixel mystery collage of Celebrity Male Role Models at US$1 per pixel.